"Border Town Bullies" by Megan Horning, UNM Law School Class of 2017, was published in the current issue of the National Lawyer Guild Review. Megan Horning is a fierce advocate for people in need – especially for individuals and families in Indian country whose experiences are not addressed thoroughly in our current legal system. Her paper documenting the deceptive predatory lending practices by Navajo Nation border town auto dealers and subprime lenders was recently published by the National Lawyers Guild, the nation’s oldest and largest progressive bar association. Now Horning wants readers to share the article and the information in it to help end these unfair practices. The 2017 UNM School of Law graduate’s paper, Border Town Bullies: The Bad Auto Deal and Subprime Lending Problem Among Navajo Nation Car Buyers, was published in the current issue of National Lawyers Guild Review. “Border Town Bullies: The Bad Auto Deal and Subprime Lending Prob­lem among Navajo Nation Car Buyers” by Megan Horning examines a par­ticularly reprehensible example of the kind of predatory lending. It explores the crushing effects predatory car loans continue to have on Navajo people. Horning explains the numerous social, cultural, economic, and geographical factors that combine to make the Navajo community uniquely susceptible to the profit-maximizing machinations of car dealerships. It comprehensively maps out the fraud, trickery, and coercion used against borrowers for whom a car is a necessity due to the remote and sparsely populated region in which they live. After diagnosing the problem, Horning goes on to suggest a list of remedies that might help protect the Navajo from continued exploitation. 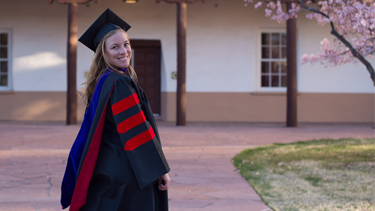 Horning says that her experiences growing up in a rural Navajo Nation border town and working with Navajo Nation car buyers at DNA People’s Legal Services as a law student prompted her to write the paper while in a Consumer Law course taught by Professor Nathalie Martin. “I am incredibly proud of Megan for writing this excellent, informative, law review article,” says Martin. “Car sales that occur on the Navajo Nation are among the most predatory in the U.S. This paper helps educate the world about this, through an internationally circulated law review.” Martin thinks it is quite uncommon for the journal to publish student work. Horning saw educational and social discrimination daily growing up in Page, AZ. Like other Navajo Nation border towns, Page serves as a hub of goods, services, and schools for thousands of Navajo Nation residents. Although most of Page’s consumers are Native American, practically all businesses in Page are owned by wealthier white residents. While working with Navajo Nation car buyers at DNA People’s Legal Services as a law student, Horning became passionate about providing legal services to low-income Navajo clients. At DNA, much of her work involved consumer law issues such as fraudulent car sales and loans, mobile home mortgages, tax, holiday, and pay day loans. Awareness is the first step. Read the article; learn more about the problem and the solutions Horning proposes. Then share it and the information in it as widely as possible to end these unfair practices and to empower Navajo car buyers, families, and communities by making them finan­cially stable.